Cascade Falls in Giles County is one of the most beautiful waterfalls in Virginia. 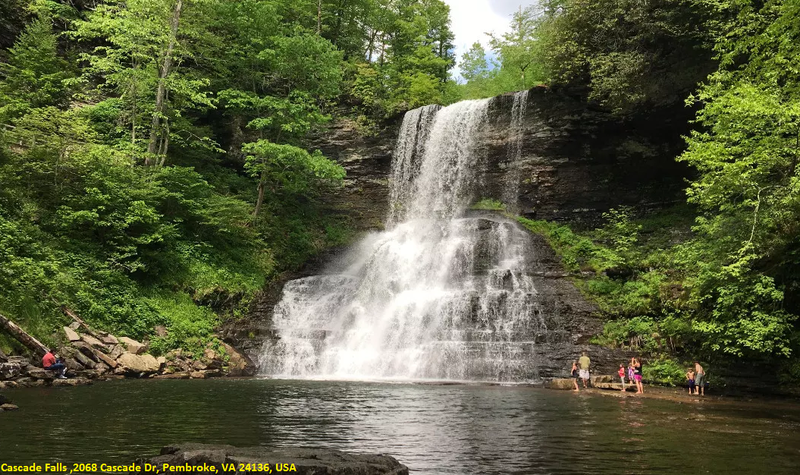 The 69-foot falls that are created as Little Stony Creek and other streams converge on this spot and create the surrounding pool provide an incredible view for visitors. In the winter, ice forms along the 200-foot cliff walls that surround the falls, creating a truly magical frozen scene. The hike at Cascade Falls is a four-mile loop with an upper and lower trail. The upper trail offers great views of the creek, while the lower trail is the portion with the most spectacular perspective of the falls. To reach to the cascade Take exit 118 1-81 N on US-460. Make sure to bypass exits for Christiansburg and Blacksburg. After about 26.6 miles, make a right turn on Cascade Drive (SR-T623) in Pembroke (there is a gas station at the right turn). The entrance will be in 3.3 miles.Things to remember : There is a $3 entry fee per vehicle (cash only). If unpaid, there is a $75 ticket. The pay area is at the entrance and directions are on the bulletin board.